The COBRA N+ designers developed sportily styled body components for the Japanese sports car: The COBRA N+ front spoiler made from flexible PU-Rim not only lends the 350Z more passing prestige but also minimizes aerodynamic lift on the front axle. The front is further refined with a special COBRA N+ grate made from high-gloss stainless steel. The COBRA N+ program further features striking chrome styling elements that look like air outlets in the front fenders, as well as a tank lid made from polished aluminum and chrome covers for the exterior mirrors. The COBRA N+ chrome covers for the standard rollbars provide even more purebred roadster looks. 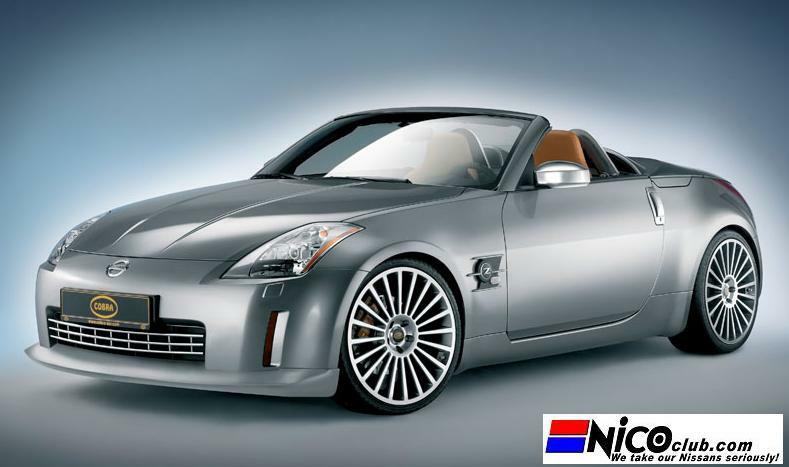 To give the Nissan 350Z even more agile handling the COBRA N+ engineers developed custom-tailored tire/wheel combinations with diameters of 18, 19 and 20 inches as well as lowering kits and sport suspensions calibrated to these wheels and tires. The largest version in the COBRA N+ wheels program is the COBRA N+ CN6 light-alloy wheel with sporty multi-spoke design. In size 8.5Jx20 with 245/30 ZR 20 tires in front and in size 9.5Jx20 in the rear with 275/30 ZR 20 tires it perfectly fills out the available space under the wheel arches. Customers can also choose between COBRA N+ sport springs for a ride-height lowering of the roadster by some 30 millimeters and two height-adjustable COBRA N+ coil-over sport suspensions. The suspensions are made from stainless steel and come with either adjustable rebound or with adjustable bound and rebound. Both versions lower the ride height of coupe and roadster by between 20 and 40 millimeters on front and rear axle. The COBRA N+ dual-flow stainless-steel sport rear muffler not only lends the 350 Z a more striking rear appearance, it also produces a more powerful engine sound. The cockpit of the two-seater coupe and roadster can be upgraded with special stainless-steel sill plates with illuminated COBRA N+ logo. A 2-year warranty with unlimited miles documents the high quality of COBRA N+ components and parts.